In the latest round of 2014 financial results for US firms, Cooley has revealed turnover growth of 19% with revenues of $802m while Mayer Brown recorded a 12.8% increase in profit per equity partner (PEP) after generating revenues of $1.223bn. US firm revenues for 2014 have kicked off with Weil, Gotshal & Manges showing a comeback in its results after profits and turnover plummeted in 2013. Last year, delivering our annual results issue, Legal Business remarked that the age of turbulence facing law firms since the 2008 banking crisis was far from over. And so it has proved. Despite all the talk of returning confidence, and clear evidence of recovery in the UK economy, it’s still choppy out there. Stripping out another year of consolidation, the numbers are a little better than 2013 but that’s about it. Having endured a difficult time in recent months with an exodus of partners from its London office, US law firm Edwards Wildman Palmer published its UK limited liability partnership (LLP) accounts in August, which recorded a 10% drop in UK turnover, alongside a 21% drop in profit. The LLP accounts, dated to 31 December 2013, show revenue fell to £25.1m from £27.8m, operating profit decreased to £8m from £10.1m and net debt rose to £323,827 from £54,952. As some seasoned campaigners of the second half of the LB100 prepare to move up a class through mergers, a few City-based specialists continue to defy the tide of consolidation. 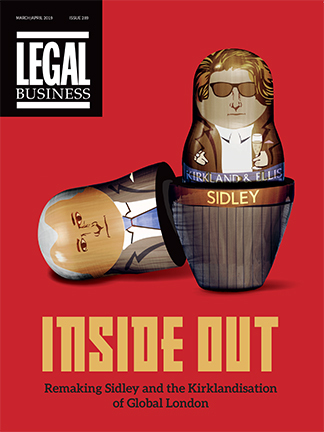 Of the merger activity that has swept through the Legal Business 100 (LB100) this year, it is the mid-market City players and national heavyweights that occupy the second 50 of the LB100 that have been most affected. Profits at Dechert’s UK LLP dropped 21% from £35m to £27.7m for the 12 months to 31 December 2013, according to filings recently made to Companies House, with total revenue falling to £67.7m from £70.0m. Having endured a difficult time in recent months with the exodus of multiple partners from its London office, US firm Edwards Wildman has also seen financial challenges in the UK as evidenced by its latest LLP accounts which recorded a 10% drop in turnover to £25.1m from £27.8m, alongside a 21% drop in profit available for discretionary division among members to £7.6m. Mishcon de Reya has hit its target of £100m in revenues by 2016, with 2013/14 turnover up 18% to £104.6m and profit per equity partner (PEP) up by 16% to £975,000, constituting 107% growth since 2009. The results come as Pinsent Masons enjoyed an uptick in its financials for a second successive year, with revenue up 4.6% to £323.3m, while profit per lawyer increased by 11% from £40,000 to £44,500. PEP increased 4.7% from £387,000 to £405,000.